BUFFALO, N.Y. – It was a long 60 minutes for the Massachusetts hockey team Saturday night. The most remarkable season in UMass history came to a staggering finish in the KeyBank Center, after the now two-time defending champions Minnesota-Duluth made it look easy with a 3-0 victory. From the opening minutes, the Minutemen (31-10-0) were on their heels, frantically attempting to put together rushes that were disrupted every time. The Bulldogs (29-11-2) were heavy, tenacious and relentless on the puck from start to finish. UMass never truly got a grip on the game. “[Minnesota-Duluth was] a more mature team,” coach Greg Carvel said in the postgame press conference. “For whatever reason our compete level wasn’t at the level it usually is. I don’t know how much of that was Duluth, how much of it was us playing late on Thursday night, not being able to recover as well as we hoped to. Carvel believes the loss to a team like Duluth will serve as a ‘step forward’ for the Minutemen. Getting to experience a matchup with one of the most dominant programs in all of college hockey can only prove helpful in the long-run for the UMass hockey program. Kurt Keats was a lone bright spot for UMass, generating some of the best chances of the night from the fourth line. The senior was playing like it was his last game in a maroon-and-white jersey and it showed. “He plays with his heart,” Carvel said of Keats. “Tonight he was a very good player. In the national championship game, he was one of our best players. He’s thanked me for keeping him around. I thank him for what he’s brought to the team. The Minutemen were outshot 25-12 through the first two periods, and somehow managed to match the Bulldogs’ shot production in the third (6-6). A lot of Duluth’s dominance came in the faceoff circle, as they held a 31-20 advantage from the dot. 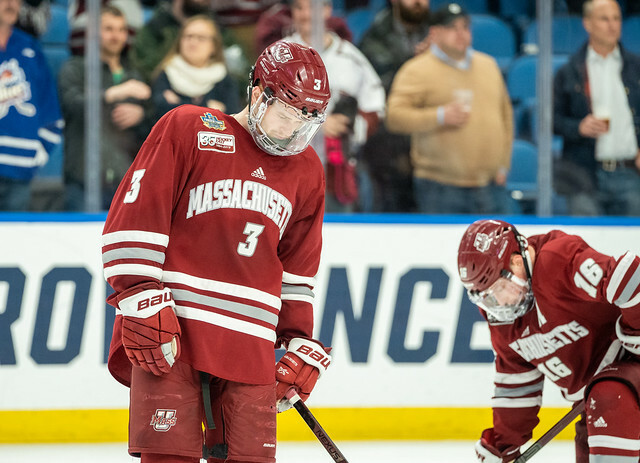 UMass came out as most people expected a new team stepping onto the national stage would: jittery, star-struck and over-powered. Filip Lindberg was tested early, facing five quick shots right off the bat in the first. Careless turnovers and easy giveaways plagued the opening 20 minutes for the Minutemen. So, it wasn’t surprising when the Bulldogs jumped on the board early. Marc Del Gaizo took an interference penalty and a little over a minute later Duluth captain Parker Mackay flipped one past Lindberg to take the lead. The Bulldogs carried a 57-second power play into the middle frame after a huge hit from Jake Gaudet sent him to the box toward the end of the first. The Minutemen managed to kill it off and had a better period than the first. The rest of the second couldn’t have been more frustrating for UMass. Cale Makar was bodied off the puck for probably the first time in his collegiate career and every time the Minutemen looked like they were going to make a rush, it was spoiled. At one point, Duluth got away with having too many men on the ice. And then shortly after Mikey Anderson made it a two-goal game, going top-shelf on Lindberg at the 15:48 mark. All the Bulldogs had to do in the third was play it out and, as they did all game, outmatch the Minutemen on all sides of the ice. But a back-breaking tally at the end of the final frame from Jackson Cates officially ended UMass’ season. “They’re a big, strong hockey team. We knew that,” Carvel said. “I’m not sure why we were not our normal-selves tonight. Again, probably because of Duluth. But we have some kids on our team that usually play big, heavy, compete, create offense through that.